Chocolate is one of those foods we all revel in but know little about. There’s something about the perfect tempered piece of bittersweet chocolate that is completely irresistible. But, it’s an industry that is constantly emblazoned with controversy over the land and people that produce the beans needed for our favourite treat. Internationally, most chocolate beans come from West Africa, produced at a very unfair price with child labour. We’re talking about 1 euro per kilo. 1 euro is the standard confectionary chocolate price and it’s really bad because for these farmers and families that is not enough so they end up shifting to another process, whether it’s quinoa or rice or palm oil. So it’s not sustainable. 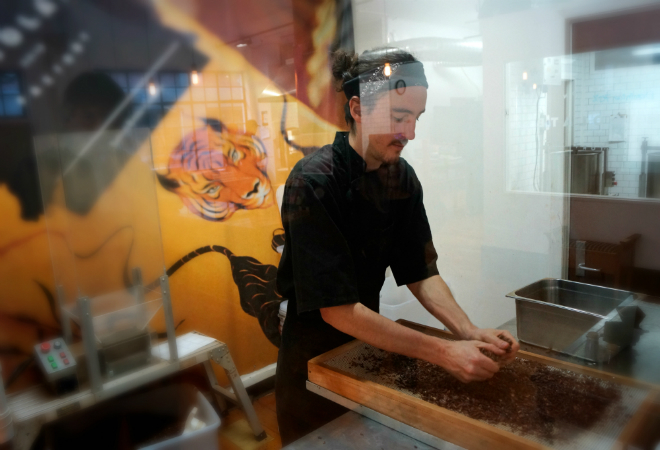 Wellington Chocolate Factory is New Zealand’s first bean-to-bar factory intentionally making products with a commitment to ethical trade and production transparency. 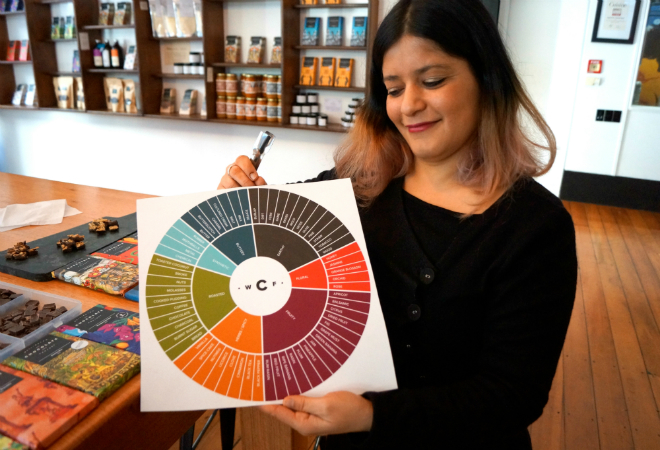 “Part of the core values of this factory from the start was not just making a quality bean to bar chocolate, it was also sustainability, ethics and fair trade,” explained General Manager Miriam Ramos. 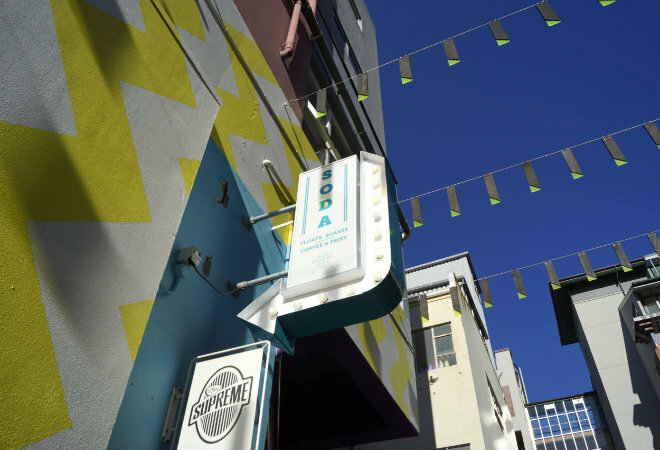 Located in Hannah’s Laneway, the business was started by Rochelle Harrison and Gabe Davidson in 2013, and it has only been onwards and upwards. The factory space used to be a youth centre. It’s a very old area and the lane was old, damp and dark. No one would dare go through the gates, it was just the people that were living here, the residents. The laneway caught the attention of the city, and as it became more beautiful it’s become a bit of a tourist destination as well. 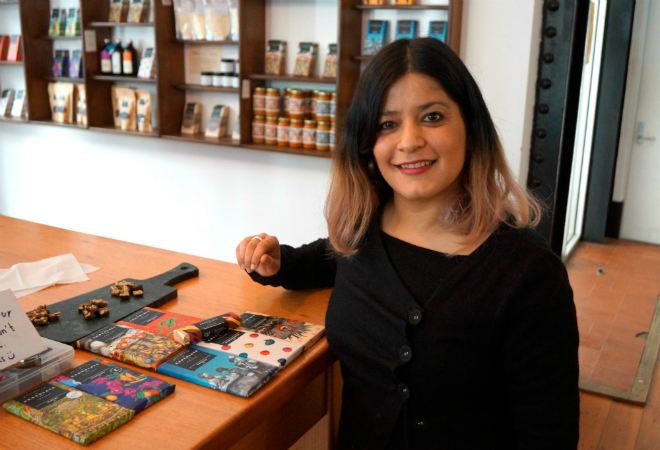 The company is working to craft perfect morsels of artisan single origin chocolate that come beautifully presented in wrappers designed by local artists and educate consumers at the same time. 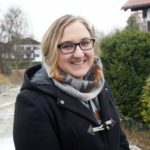 “We work with different origins at the moment. The first origin we work with is Peru Norandino, it is a cooperative and they’ve been growing these trees for about two thousand years. It is also the purest chocolate, it’s piura blanco and it is very rare. Only 8 percent of chocolate in the world comes from Peru. And the reason for it is because they really protect their trees,” said Ramos. The bars – Peru, Dominican Republic, Bougainville, Samoa – are priced between $11.50-$13.50. They wondered, will people buy them? 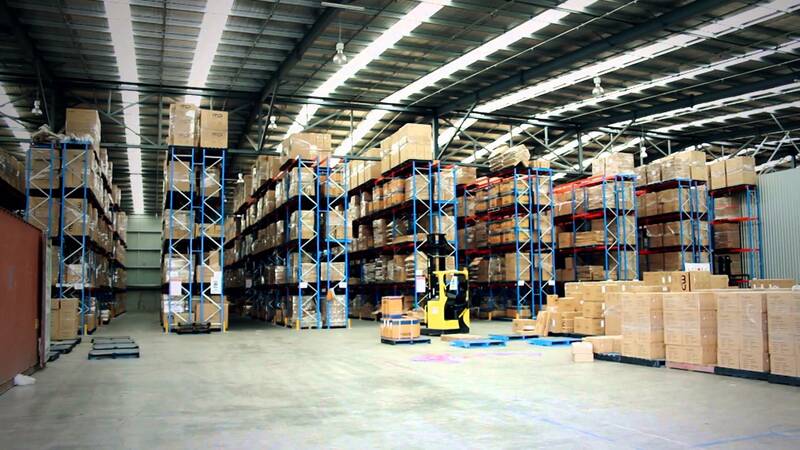 People are buying them because they see the value and because the factory is open to the public. Strolling through the laneway, people come to the factory, see the process, taste the chocolate, hear the story and see that it’s real, good, whole food. With the beans, the first thing that they do is sort them and remove the bad ones. In a small oven they light roast the beans, a tray at a time, and slowly with different varieties of temperature. When that’s done they need to crush them and separate the husk from the bean nibs. The next few steps of the process go on for days and it’s completely artisan as they have people involved in every part. 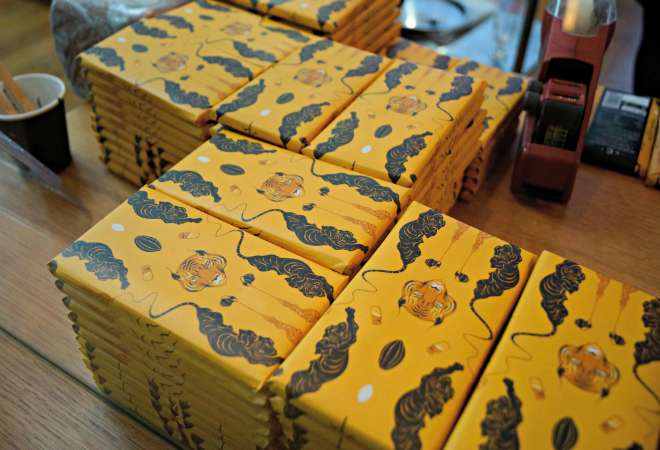 Their Bougainville limited edition bar has a story printed in the wrapper detailing the bean and boat journey. 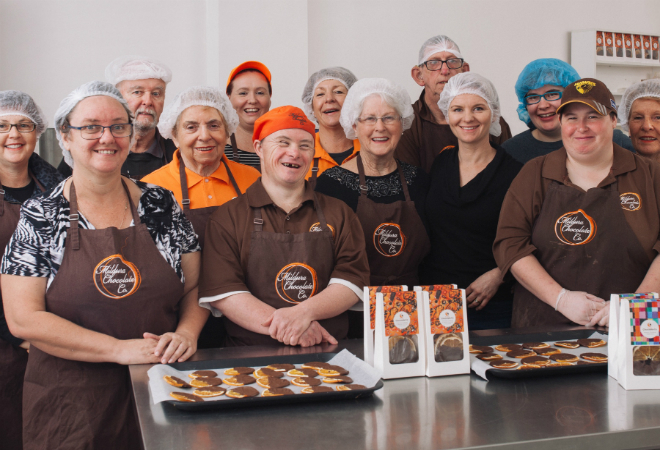 Back in 2014, the business successfully met their Kickstarter goal of $36,000 for what they dubbed “The Wellington Chocolate Voyage.” The project revolved around the improvement of the growing, trading, and eating of chocolate. Harrison and Davidson transported a ton of Criollo beans from Bougainville to the Wellington by sailing ship. The salted brittle caramel bar is a blend of Criollo and Trinitario beans, it’s a perennial favourite and most popular bar. The factory is working to put themselves and these regions on the global stage but as they export, grow and expand but do it in a healthy way. To begin with, they want to get as many people in the door and understanding the chocolate process. 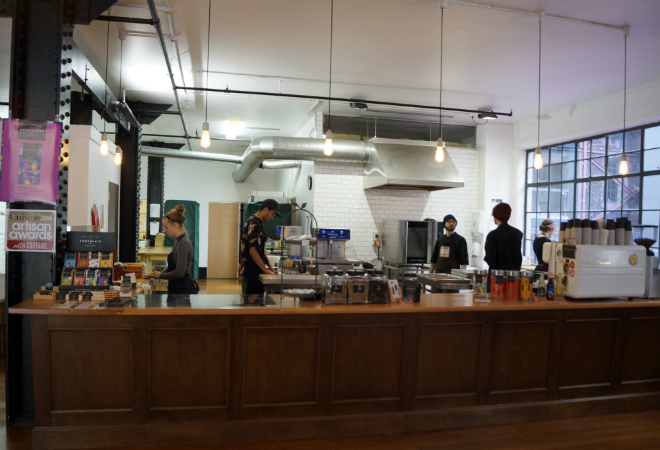 The factory is also working with other small to medium-sized businesses in the laneway and the Wellington region to mutually strengthen their abilities.